Snow storm is a comin’. 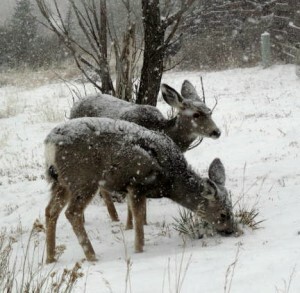 On my way home after work I passed these little critters getting their last meal before they hunker down to wait it out. Weather will be downright frigid Tues. and Wed.
We had a great weekend, weather-wise and business-wise too. Fun. Forecast Monday calling for snow by 2:00 pm and accumulating 4 to 6 inches in La Veta, and 8 to 10 inches in Cuchara by Tuesday afternoon. And that’s OK with us. We have been very dry and really need that moisture for the spring run-off water supply. If you live in southern Colorado, then you know what warm clear days we are having. In the 50’s today and possible 60 tomorrow. I have clients both days this weekend so it’s nice that the weather is co-operating. The warm weather will turn back to snow showers next Tuesday. Just in time for the second weekly wine classes at La Veta Inn. Alys’ is hosting the 6 weeks classes on wine. Word on the street so far shows lots of interest. We saw Don Ayers last week and he too is getting the Timbers Restaurant in Cuchara ready to re-open soon. So come eat, drink and be merry with us real soon. Some of you may want to make note of the new Huerfano County Emergency Dispatch phone numbers. In bringing the new system up to date, Dispatch personnel will only be able to answer either 911 for emergency or 738-1044 for non-emergency. This is for Dispatch routing to police, sheriff, marshall, fire or ambulance. You may still place direct calls to County Sheriff Office personnel for non-emergency info. at 738-1600 but this should not be used for emergency dispatch. 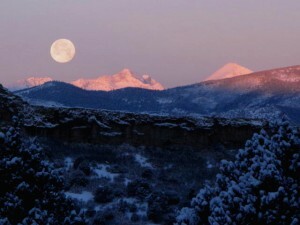 WOW, I saw the most beautiful full moon setting at dawn, just before sunrise daylight. Rio Grande Scenic Railroad officials were in LaVeta this past week presenting plans for more fun specialty events this summer. The railroad is wanting to promote a Photographers Excursion trip, bringing as many as 200 folks to LaVeta for an overnight stay, concert in the park and other activities. And ideas for an Artist Train are in the works as well. And they announced an intent to hire a full staff of La Veta locals this year, from Conductor on down to ticket agents. Could provide 6 to 8 new jobs in our community. Local buzzzz is that the Covered Wagon may be Under Contract. And a new mexican restaurant could be a part of that business plan. Meanwhile, more people are also looking at the old Blue Rooster-Pub building but the new Bistro Brewery is closed- only temporarily we hope. Comments Off on More Restaurants? It’s been a little cold and blustery after the earlier snow. But weekend is predicted to be warming nicely. Have clients flying in from Houston area to look at some property so nice weather would be good. Of course gotta have some time for the playoff games too, right? The Cuchara Valley is beautiful today with 4 inches of fresh new snow. Pure, clean, it renews our spirits and refreshes our outlook on things.